I've been experimenting with a lot with baked apple goods recently. If you haven't tried my Honeycrisp Cake or Sautéed Apple and Cinnamon Pancakes, I suggest doing so while apples are still in season. Eating apples in the fall makes all the difference for taste. Apple season is my favorite time of year, I could happily subsist eating multiple every day if I wasn't concerned about the balance of my glucose and insulin levels. Surprisingly I had never made a galette, so I was pleasantly surprised with this experiment. Enjoy, friends. Combine flours, coconut oil, coconut nectar, 1 teaspoon of cinnamon, and vanilla bean paste. 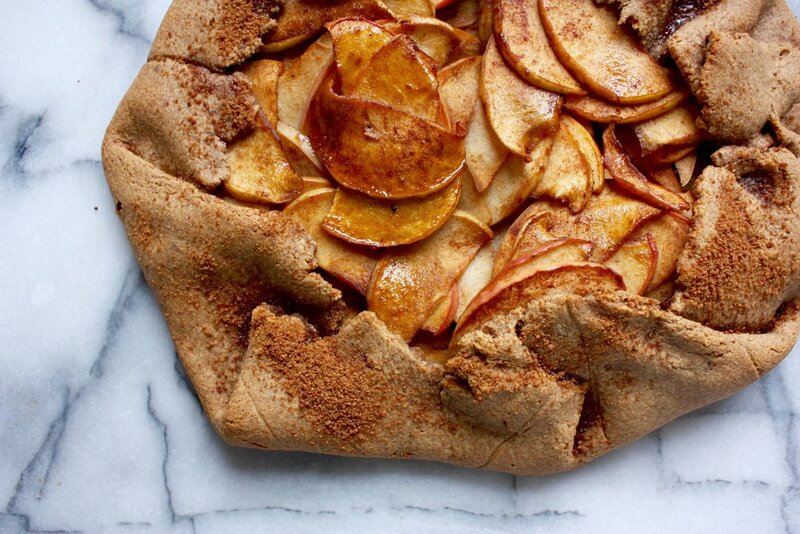 Mix until a dough forms, place in fridge while you prepare apples. 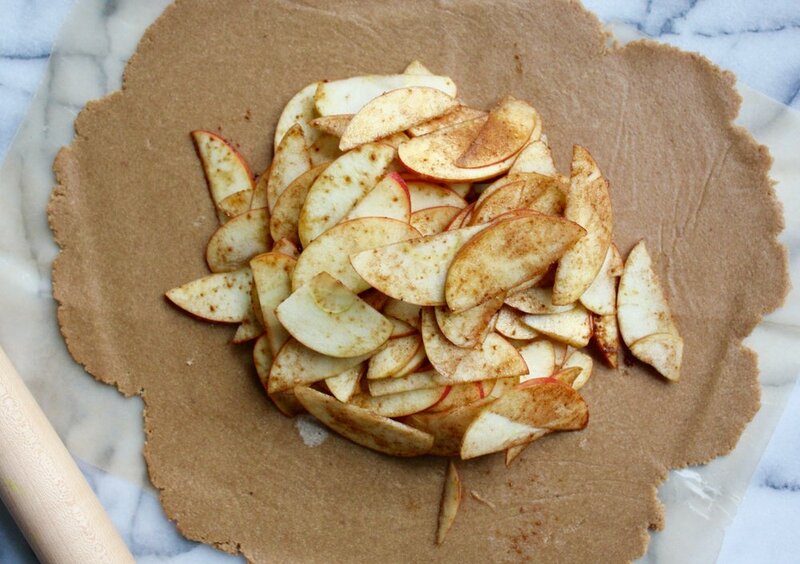 Cut apples into thin slices, toss in 1 teaspoon of cinnamon and 1 tablespoon of coconut sugar. Take dough out of frige, roll into a circular crust between pieces of parchment. Use the size of the parchment as a guide for how large it should be, as when it hits the edges, you're done. 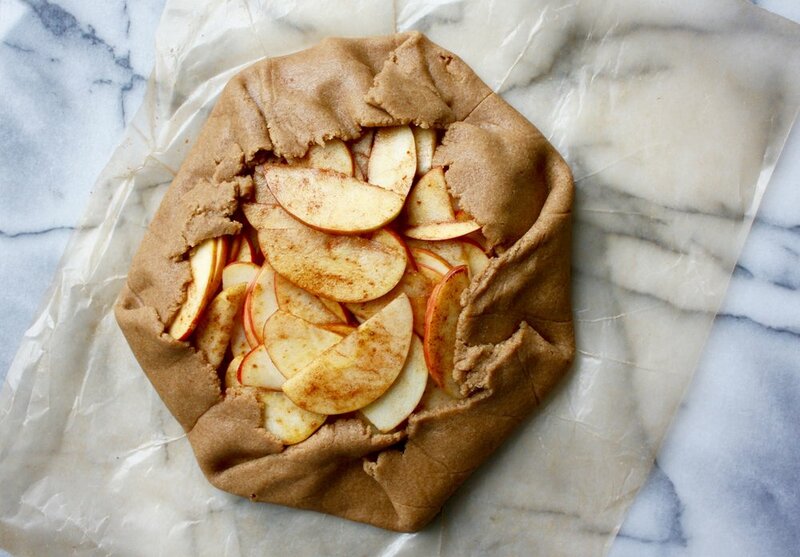 Add apples to the center, and fold the sides over in any pattern. Transfer galette to a lined baking sheet, bake for 40 minutes at 350°F.